Friends of Elizabeth II, Inc. (The Friends) is a 501c3, established in 1982, in conjunction with North Carolina’s 400 Anniversary of the Roanoke Voyages. The Friends original purpose was to assist with raising the funds for construction of the representative sailing ship the Elizabeth II, to fund its maintenance, to support the work of the volunteer crew, and to help fund its voyages. The Elizabeth II was subsequently gifted to the State of North Carolina by the Friends, becoming one of NC historic sights and the responsibility of the Roanoke Voyages and Elizabeth II Commission. 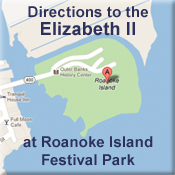 Over the years there have been many changes and today the Roanoke Island Commission is responsible for the Elizabeth II and the site of her home port, Roanoke Island Festival Park. In the 1990s, the Friends of Elizabeth II expanded its mission to include financial and volunteer support for the whole site and the operation of The Museum Store.